The Ethiopian city of Harar is known as the religious center in the Eastern region of the Horn of Africa. This importance can be read from local terms as “city of saints” or “fourth holy city (of Islam)”. The shrines of the local saints and the practices, beliefs and symbols connected with them are playing an important role in the social life of Harar. But in which way does sacredness as pre­cise reflection of a particular time and place influence modern society? And how does sacredness come to terms with global flows of Islamic reformations and may be able to represent a combination of local creation of meaning and global alternatives? The present study analyzes the dynamic relationship between public discourses, religious practices and processes of social change in Harar. It is shown that the debate concerning sacredness in Islam repre­sents more than just a controversy about theological contents. In fact, it reflects a competition between social groups, exceeding the meaning of local sacredness in a great way. The culturalization of religious practices and sacred places is an essential aspect of this debate. Analyzing this, the present study deals with a basic problem of anthropologically motivated Islamic studies: Can the heterogeneous living environments of different Muslim societies be explained with the claim and dogmatics of a universalistic Islam? The discussions regarding sacredness can be considered as representative source material for this question, because they are placed at the border of a locally molded Islam on the one hand and the need for universal validity on the other hand. This book is a contribution to the socio-scientific analysis of Muslim societies in Africa, to the ethnography and history of Ethiopia and to the relationship between religious practices, local power structures and translocal net­works. Als Harär-Fan erfreut mich natürlich jede neue Monographie über die Stadt. Die vorliegende, aus dem DFG-Sonderforschungsbereich „Kulturelle und sprachliche Kontakte. Prozesse des Wandels in historischen Spannungsfeldern Nordostafrikas/ Westasiens“ hervorgegangene Mainzer Dissertation von 2008 ist aber besonders zu begrüßen, da sie erstens mit einer neuen Perspektive an die heilige Stadt herangeht, zweitens viel neues faktisches Material liefert und drittens auf Feldforschungen beruht, die nach den Umwälzungen am Ende des letzten Jahrhunderts stattfanden. [...] Ich hoffe, dass das hier Wiedergegebene gezeigt hat, dass es sich bei Desplats Dissertation um ein sehr interessantes und lehrreiches Buch handelt, dessen Lektüre Islamkundlern und Äthiopisten sehr zu empfehlen ist, und natürlich auch Ethnologen, in deren Umfeld es ja entstanden ist. Desplat's study, based on fieldwork, asks how sacredness in a certain place and time affects present-day society – exemplified in Harar – and how it interacts with „global flows" of Islamic reform processes. The author analyzes the dynamic relation between public discourses of religious practice and societal change. He shows how the debate on sacredness in Islam not only represents a controversy on theological issues but a competitive battle between social groups way beyond the local setting of sacredness, and the culturalization of religious practices and sacred places is a central facet of this dispute. Thus, the present study deals with a general problem of anthropologically inspired research on Islam: Is it possible to explain the heterogeneous lifeworlds of various Muslim societies with the claim and dogmatics of a universalist Islam? In this context, discussions about sacredness are representative here, because they are situated exactly at the interface between a local Islam on the one hand and the need for universal validity on the other hand. 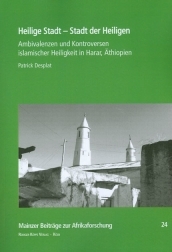 Desplat’s book is a contribution to studies on Muslim societies in Africa, on the ethnography of Ethiopia and the relations between religious practices, local power structures, and translocal networks.